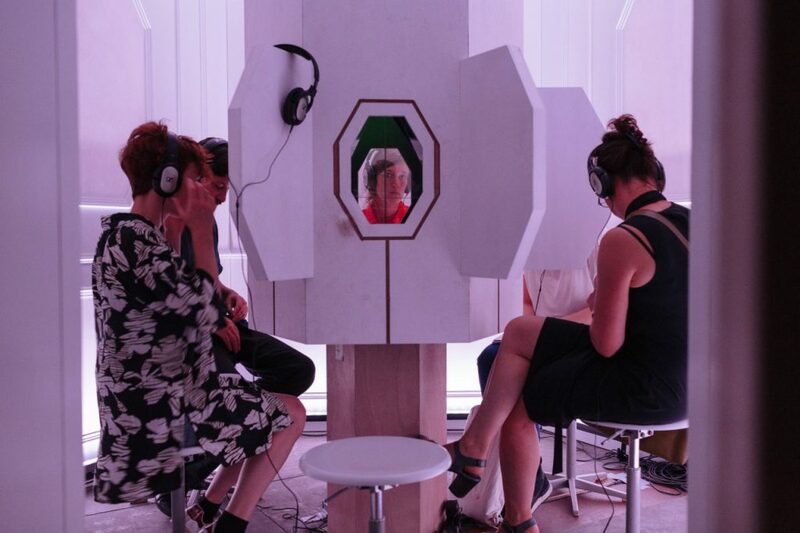 The installation Nachlass shows eight gazes at death documented by the Swiss German Stefan Kaegi. 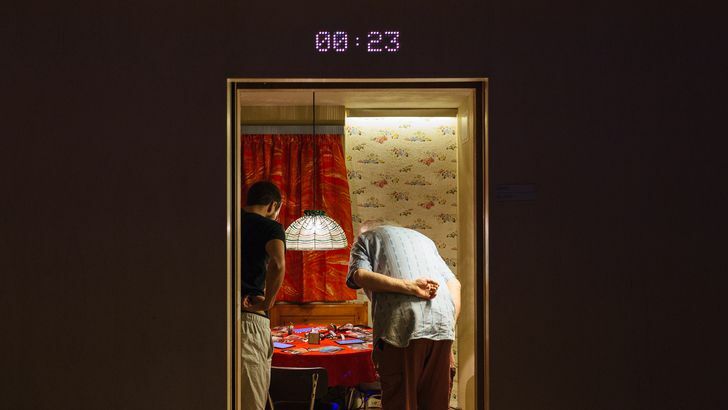 The NAVE’s black box was adapted to have inside the moving experiences of people who were close to death, either because of their hobbies or because the old age is getting them closer to death. They are people whose reflection towards their legacy is unavoidable due to their proximity to the greatest mystery of life. A corridor of total darkness is the path that leads to an oval room of an aseptic whiteness, where eight doors with regressive accounts protect the mysteries of the beyond. On the roof a large screen shows a simulation in real time of the deaths that are happening across the planet. “Before jumping, I call a friend, to let him know, to tell him that if he has not heard from me in 15 minutes, call emergency.” These are the words of a parachutist, a family man who can’t spend more than three weeks without being thrown from a plane. In his case he lives with death almost for pleasure, but the freedom he feels in each jump does not let him escape from his dangerous activity. Back to the hall of the doors, someone wipes a tear, people who leave another room ends up putting their shoes on, an elderly couple takes their hands in a meaningful way. Which of the eight doors to choose next? The countdown in red ends, the door opens, and a blank count begins which indicates the remaining seconds for the room to close again. Planned death is also one of the themes that is discussed in Nachlass. How to tell the children that their parents have decided to die on the same day? How do you explain to grandchildren that their grandparents got tired of living? Two tablets on a desk give the reasons for the marriage that wants to cease its existence, on the left screen comes the voice of her, on the right screen of his. It is as if they were present, but they remind us that when we hear this, they will have gone. Another room A man born in Turkey has another problem, thinking about his death forces him to prepare his mortuary rites. “Muslims buried us wrapped in cloth, without coffin, but in Christian cemeteries you can not do that.” His religion motivates him to undertake the same trip he will make when he dies, the funeral home, the airport that transports the traveling coffin, the mosque where he learned the Koran, the cemetery. He gets excited thinking that it will be the last time he visits his native country in life. There is also the desire to project existence beyond death, to leave an inheritance. That means the German word nachlass, legacy. Here two different views in principle stand out. The first is that of a woman who wants to donate her assets to a foundation that helps African artists. The second vision is the legacy that wants to leave the man who was part of the Hitler Youth movement, who fought in World War II until he received two wounds that forced him to withdraw from the battlefield. Both want their legacy to help change the world. Although all the rooms have different designs, with settings as divergent as the generic room of a motel or the office of a bank, the one that stands out for the technological and geometric design (whose first glance recalls scenes from Odyssey 2001) shows the testimony of a doctor who invites you to reflect on Alzheimer’s disease. On the one hand there is the medical desire to prolong life, on the other the loss of memory and personal identity. The mirrors in this room make it impossible for the spectator to escape from meditation on his own death, about whether we will be able to die knowing who we are. With several schedules per day, Nachlass has functions in NAVE until January 19, within the framework of Santiago a Mil. Recommendation: videos are subtitled, if you wear glasses for reading, take them to the function.